Sign up for updates and receive a FREE booster pack! Draft players and powers from a set of over 350 cards to supplement your pre-built Starter Decks. 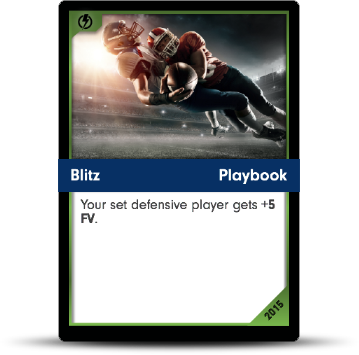 Devise plays and strategies to build an unstoppable passing offense or the ultimate shutdown defense. Dominate the league, crush the competition, and become legend. Just like football, your goal is to advance the ball toward the opponent's end zone and score. Using 30-card offensive and defensive decks, you'll use players and powers to do it! Select a section to learn more! 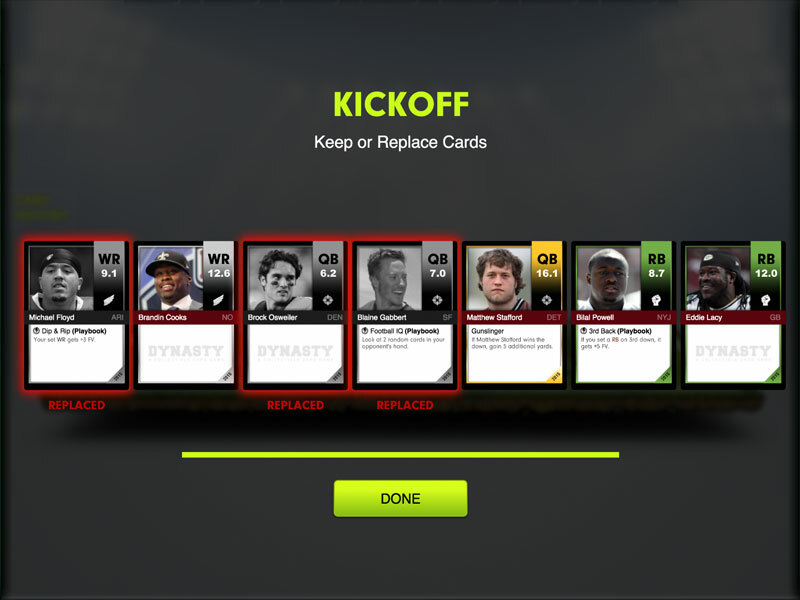 At the beginning of every first down, you may discard any number of cards in your hand and redraw up to 7 cards. These cards make up the majority of your 30-card offensive and defensive decks. 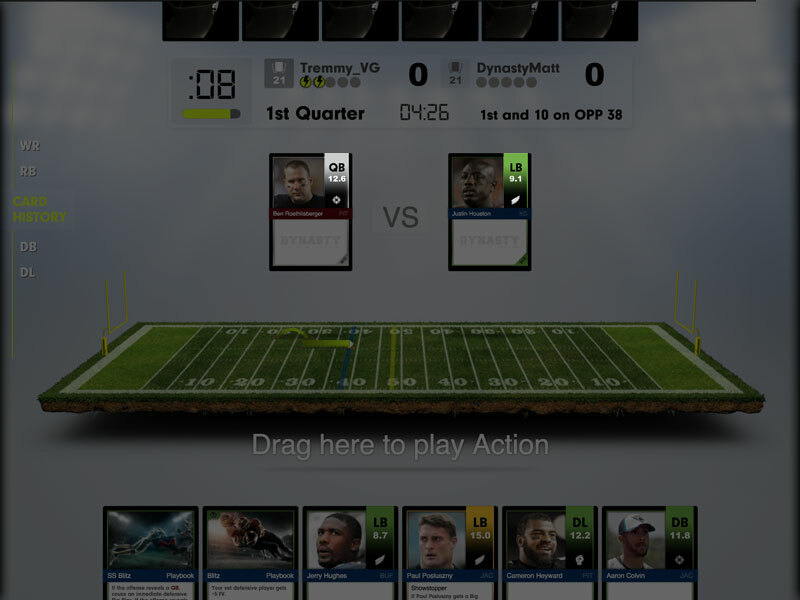 This number is their Fantasy Value, which is based on the player's real-world stats, just like in Fantasy Football. 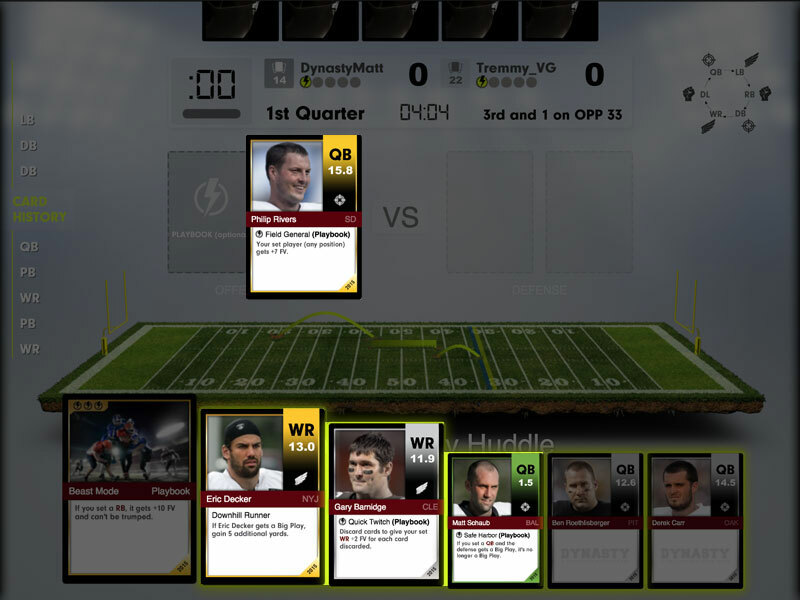 At the beginning of a down (before the snap), you and your opponent each set one Player face-down. 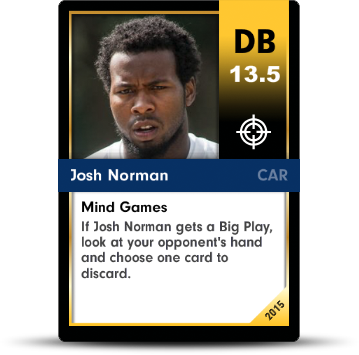 Once this happens, both Player cards are revealed, and the ball is snapped. Depending on who wins (see the next section), the down results in either a gain or defense! 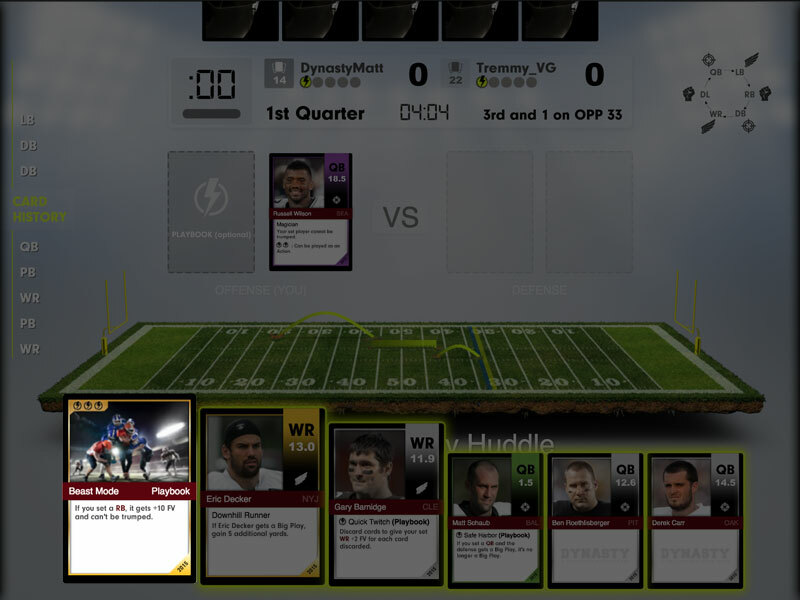 If your Player card trumps your opponent's, you win the down! 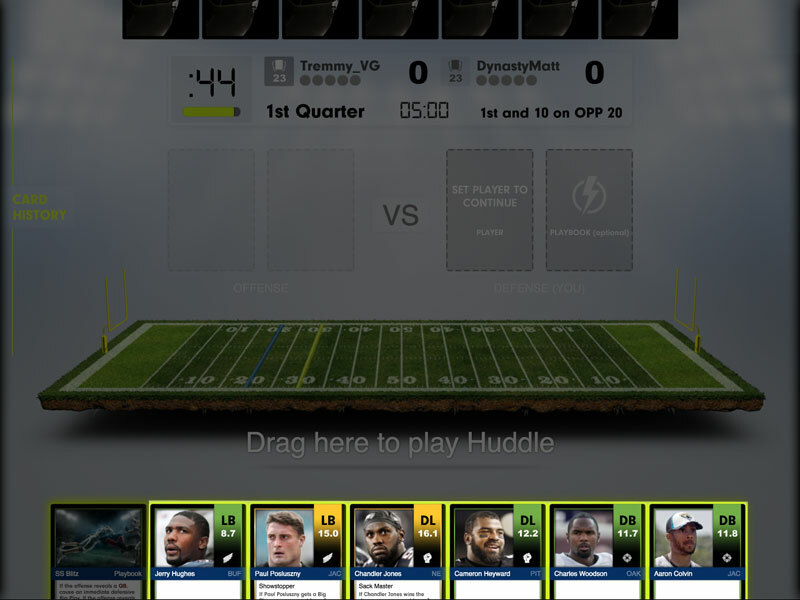 If your Player cards are neutral, that's where the Fantasy Value comes in -- higher FV wins the down! 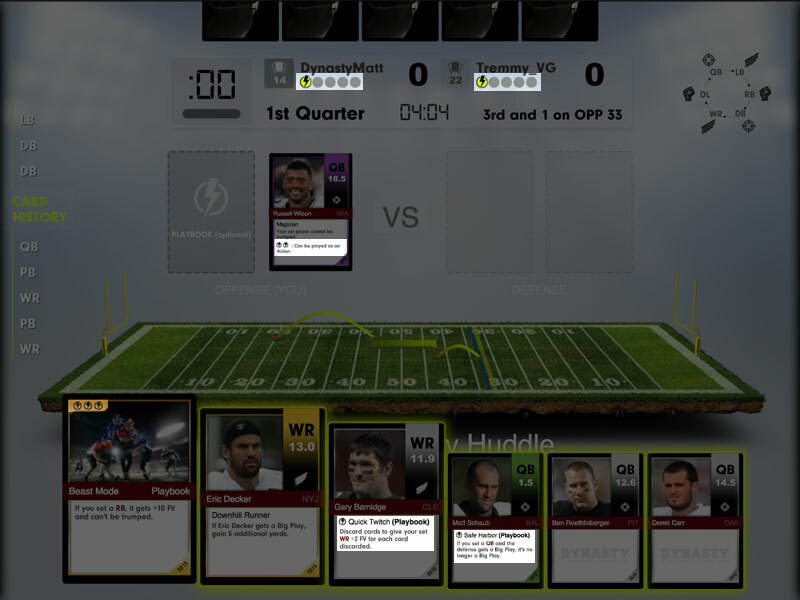 If your Player card both trumps AND has higher Fantasy Value than the opponent's Player card, you get a Big Play! 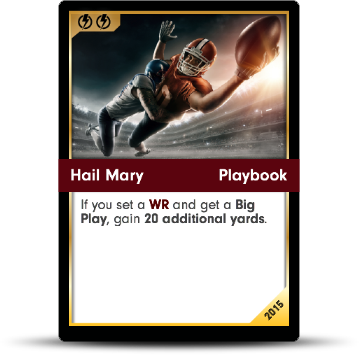 If you're on offense, this means double the yard gain! On defense, this means a loss of yards for the offense! 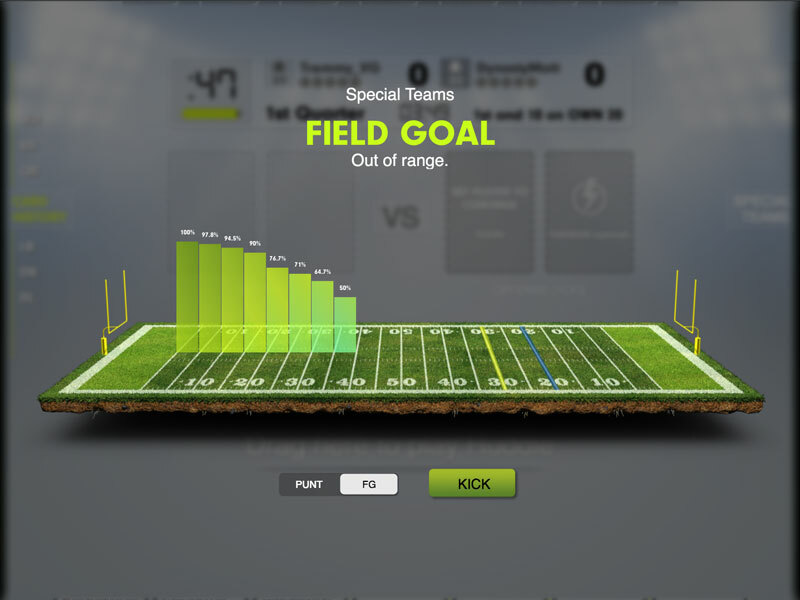 If you're on offense, you can select Special Teams to either punt or try for a field goal (if you're in range). Whenever you win a down, you gain Momentum, which is used to play Power cards. Your momentum carries over from defense to offense. 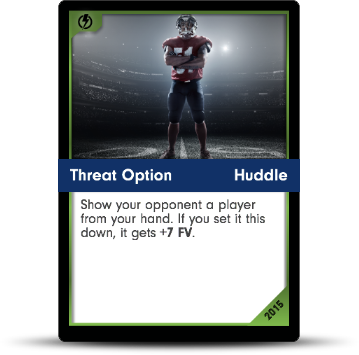 Huddle - Play these before Player cards are revealed. 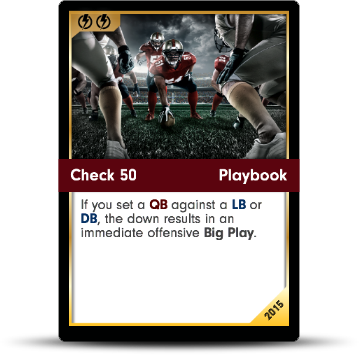 Playbook - Play these face-down next to your Player card, and they are revealed at the same time as Players. 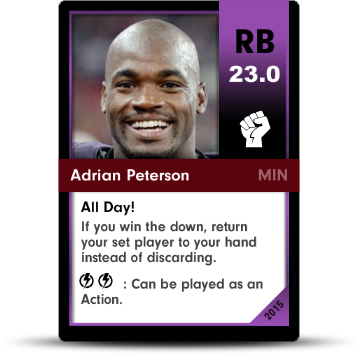 Action - Play these after Player cards are revealed. 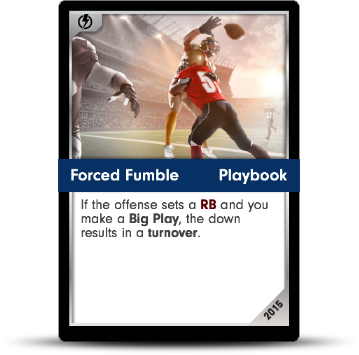 played face-down as a Playbook card to use the "Field General" ability. 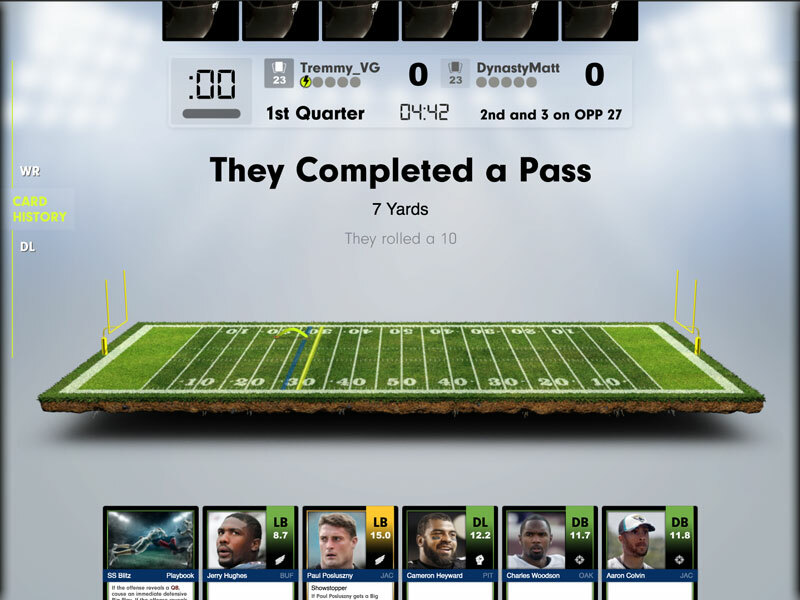 Move the ball to the opponent's end zone to score a touchdown! 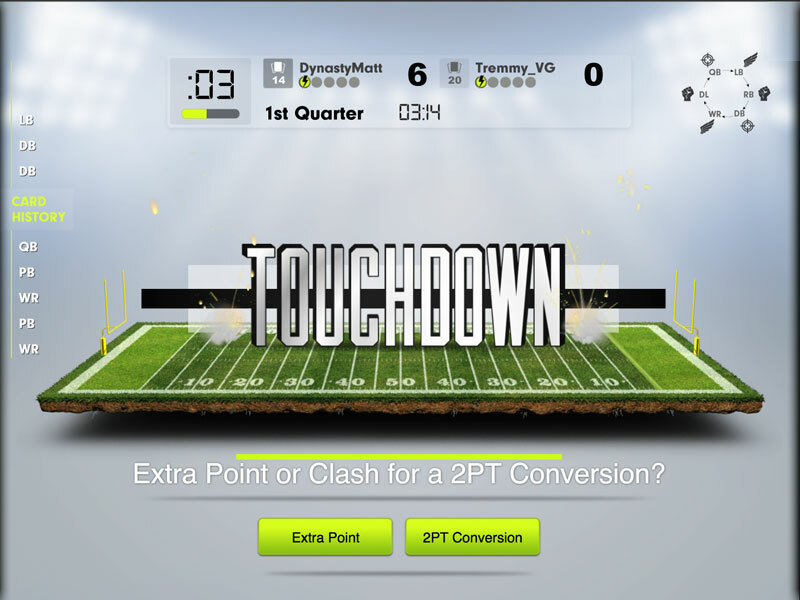 You can then choose to either get the extra point or Clash for a 2-point conversion. 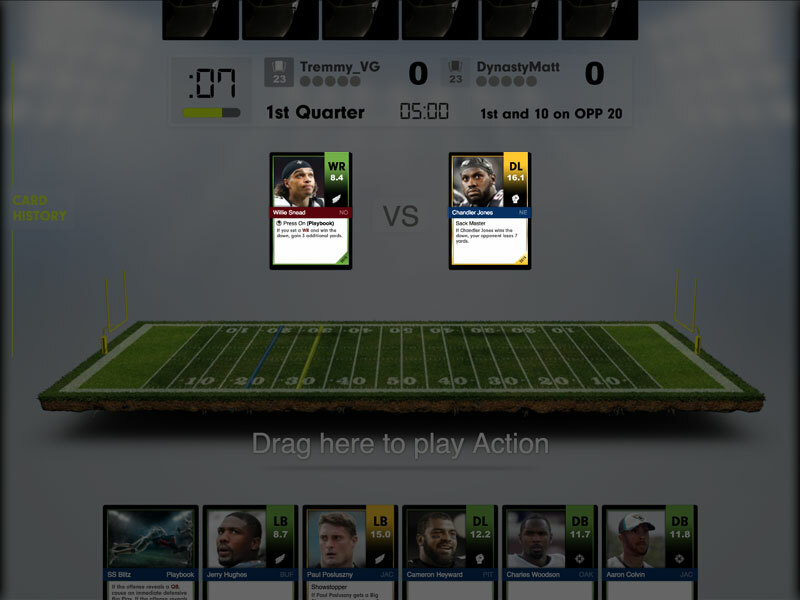 To Clash, players draw and compare the Fantasy Value of the top card of their deck -- higher FV wins!